Could Brexit spell the end of the United Kingdom—leaving ‘Little England’ to go it alone? Why might the U.K. break up? When was the U.K. formed? The British Isles have a complicated history, filled with conquests, rebellions, and reconquests. But the loose origins of the U.K. date back to the early 10th century, when the Anglo-Saxon King Athelstan unified England’s disparate kingdoms and secured the reluctant allegiance of the Scots and the Welsh. 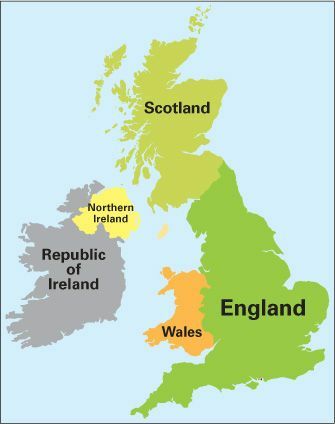 But the relationship between England, Scotland, and Wales only became official in 1707, when the Acts of Union formally created “One Kingdom by the Name of Great Britain.” That kingdom merged with Ireland in 1801 to create the United Kingdom of Great Britain and Ireland. When most of Ireland seceded in 1922, with just six Ulster counties in the north remaining under British control, that left the U.K. as we know it—stretching from Land’s End in the south to John o’Groat’s at the tip of Scotland. Could a ‘Scoxit’ be next? If Scotland’s First Minister Nicola Sturgeon has her way, yes. The country held its first independence referendum in 2014, when 55 percent of Scots voted to stay in the U.K. Sturgeon said she would hold another only if there was a “material change” in Scotland’s circumstances—such as Scotland being removed from the EU against its democratic will. Scotland currently receives more than $260 million a year in EU funding, and sends about $16 billion in exports to the Eurozone; in addition, many Scots resent the ruling conservatives in London far more than they do the bureaucrats in Brussels. To hold another plebiscite, though, Sturgeon needs the permission of British Prime Minister Theresa May, who refuses to give it before Brexit negotiations have been completed in 2019. But momentum for independence is growing. Will the U.K. break up?